Calorie: Energy that comes from food. Some foods have more calories than others. Fats have more calories than proteins and carbohydrate. Most vegetables have few. Carbohydrate: One of the three main classes of foods and a source of energy. Carbohydrates are mainly sugars and starches that the body breaks down into glucose (a simple sugar that the body can use to feed its cells). Certified Diabetes Educator (CDE): A health care professional that is certified by the American Association of Diabetes Educators (AADE) to teach people with diabetes how to manage their condition. Cholesterol: A waxy, odorless substance made by the liver that is an essential part of cell walls and nerves. Cholesterol plays an important role in body functions such as digestion and hormone production. In addition to being produced by the body, cholesterol comes from animal foods that we eat. Too much cholesterol in the blood causes an increase in particles called LDL (known as bad cholesterol) which increases the build-up of plaque in the artery walls and leads to atherosclerosis. 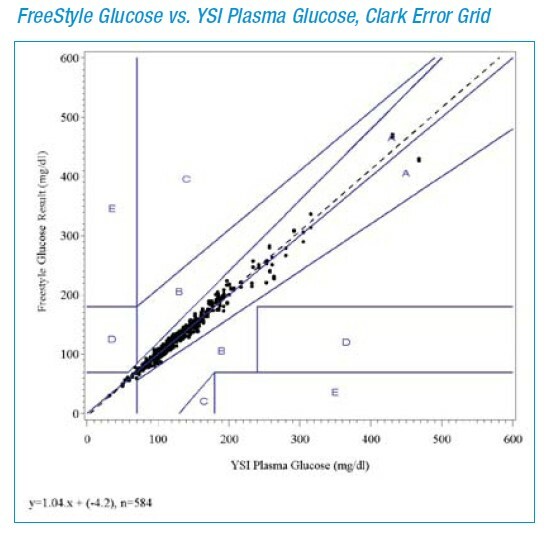 Clarke Error Grids: A grid established to chart the accuracy of a Blood Glucose Meter reading and to establish an acceptible error factor whereas an inacurate reading, when compared to a lab quality test, may or may not result in improper treatment decision making. The Clarke Error Grid is the predominate measurement of a meters accuracy in leading manufacturers. Region E are those points that would confuse treatment of hypoglycemia for hyperglycemia and vice-versa. Coulometry, Coulometric: A technic for determining the amount of matter transformed during an electrolysis reaction through measuring the electricity consumed or produced. The electricity is measured in coulombs, a unit of measuring electron flow.